← Blossom. Sizzle. Pop! This SATURDAY at Blossom!! 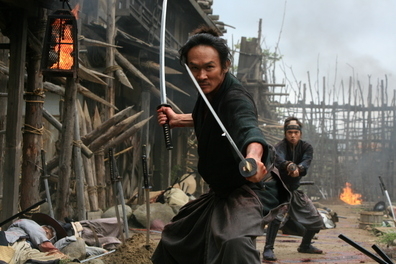 13 ASSASSINS, the new film from Japan’s Takashi Miike (AUDITION, THE HAPPINESS OF THE KATAKURIS), is one of the crazily prolific director’s very best. It’s also one of the most acclaimed movies of 2011, with a metacritic.com rating of 87 out of 100! A samurai warrior recruits an elite team of killers (“a dirty baker’s dozen,” according to critic Nick Pinkerton) in order to eradicate the Shogun’s evil brother. This funny and exciting action epic was named June’s “Film of the Month” by Britain’s Sight & Sound magazine. The Los Angeles Times calls it “a classic samurai movie…among the finest in the genre.” Thrill to it in a 35mm color & scope print on the big screen on Friday or Saturday. This entry was posted in cleveland, film, ohio, shows, theatre and tagged CIA, Cinematheque, cleveland, film, ohio, theater, theatre. Bookmark the permalink.